Teaching and education has always been about more than just the subject matter. It’s also about how the material is packaged and presented to learners. With eLearning, students might never see their teachers or meet in a group with their peers. Because eLearning lacks some of these components of traditional education, the visual aspect has become more important than ever. Good graphic design is a key part of creating effective eLearning material. There are plenty of eLearning creators who are excellent educators, but might not have been trained in visual communication. 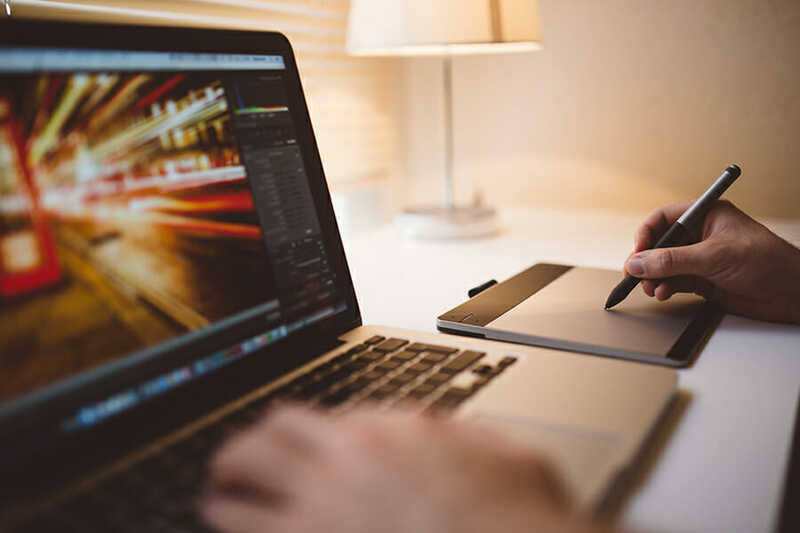 Even if you’re not a graphic designer by trade, you can incorporate these graphic design principles to instantly improve the effectiveness of your eLearning courses. 1. Use images with purpose. This means using images when they add something to the content, not when they distract from what students are meant to learn. Images should complement and enrich the text. Image quality is just as important as image content. Your eLearning content should project a professional appearance, and it can’t do that with out-of-focus, pixelated images. Using low quality images devalues your content. It can make learners doubt that your course is a reputable source of information. Whether or not they realize it, your learners strongly associate colors with certain concepts and ideas. To make sure your message is getting across the way you want it to, it’s important to understand those associations and use colors accordingly. Red: Red might be used to represent love, passion, and romance (think Valentine’s Day hearts, roses, etc.). More commonly in this context, it’s used to represent a warning or danger (it’s the color of stop signs, blood, etc.). Either way, we’re conditioned to immediately give our attention to text or accents in red. Green: Green is generally considered a “safe” color (think of green on a stoplight or a green check mark indicating approval on a form). It’s also commonly associated with health, nature, and in some contexts, money and finance. Blue: Blue tends to be associated with authority: It’s frequently used in bank logos, branding for health and drug companies, and in many other professional contexts to indicate reliability and trustworthiness. This is a great color to use for emphasis without drawing attention away from your main message. Fonts are an underappreciated aspect of good graphic design for eLearning. After all, whatever font you choose, your learners are going to spend quite a lot of time staring at it. There are literally thousands of font options out there. But your best bet as an eLearning course designer is to stick to the basics. You can deviate from these standard sans serif fonts in your titles or headings, but use other fonts sparingly. Generally speaking, you should only use two or, at most, three fonts in your entire course. It’s important to use fonts consistently as well. One font for all of the text body and another easy-to-read font for the titles and headers is a good format. 4. Keep your layout clean and logical. What does this mean for eLearning? Essentially, it means that the harder your learners have to work to understand the flow of your course, the less attention they can devote to actually learning the material. Utilize white space (also known as negative space). This literally means blank, empty space that isn’t occupied by text or images. Including plenty of white space makes your course appear neat and organized. Build your layout around key focal points. As soon as your learners open a new page or module, their eyes should be drawn to a specific element that captures what the page is all about. If your layout has too many focal points, learners will find it hard to make sense of the information on the page. The same is true if your layout has no focal points. Incorporate visuals. This relates to our first graphic design principle: Images should reflect the core message of the module. But visuals don’t have to mean photographs. Consider replacing chunks of text with infographics, charts, or graphs, which are often much easier for learners to process. Even when you are using text, create a visual hierarchy with the use of headings, subheadings, and bullet points. Microsoft Word Is Rolling Out Some New Features. But Will It Help Its Melting Popularity? Medical Training: How Do Online Classrooms Compare?